Buildings and cities age – as do humans. Sometimes we get better and sometime we do not. Some of us eat healthier and get more exercise. Some of us do not. Some of us look better as we get older. Some of us do not. So where am I going with this? We all want to live longer and live better. I think we want our buildings to do the same. It is instructive to see how some cities and buildings handle this. Think New York, Paris, London, Prague...you get the idea. Let me start out with a couple of observations based on being around a long time. 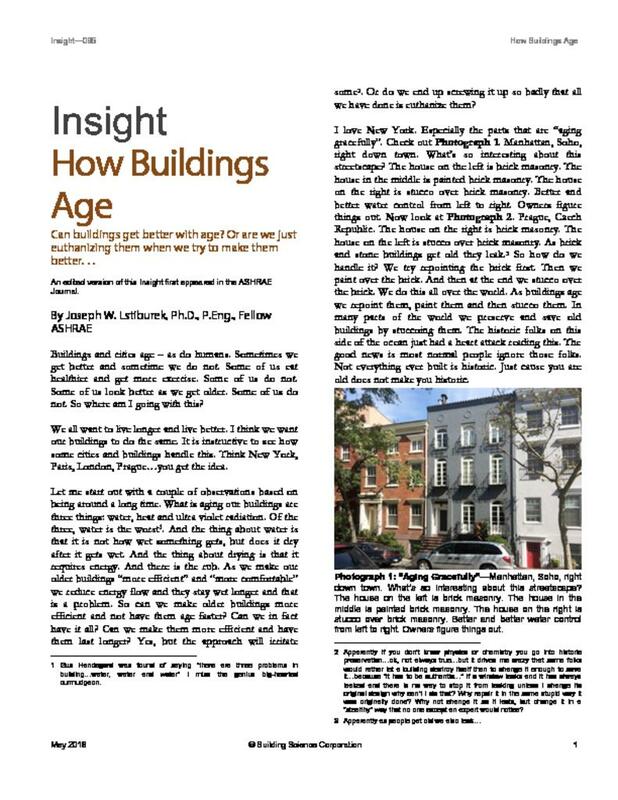 What is aging our buildings are three things: water, heat and ultra violet radiation. Of the three, water is the worst1. And the thing about water is that it is not how wet something gets, but does it dry after it gets wet. And the thing about drying is that it requires energy. And there is the rub. As we make our older buildings "more efficient" and "more comfortable" we reduce energy flow and they stay wet longer and that is a problem. So can we make older buildings more efficient and not have them age faster? Can we in fact have it all? Can we make them more efficient and have them last longer? Yes, but the approach will irritate some2. Or do we end up screwing it up so badly that all we have done is euthanize them? I love New York. Especially the parts that are "aging gracefully". Check out Photograph 1. Manhattan, Soho, right down town. What's so interesting about this streetscape? The house on the left is brick masonry. The house in the middle is painted brick masonry. The house on the right is stucco over brick masonry. Better and better water control from left to right. Owners figure things out. Now look at Photograph 2. Prague, Czech Republic. The house on the right is brick masonry. The house on the left is stucco over brick masonry. As brick and stone buildings get old they leak.3 So how do we handle it? We try repointing the brick first. Then we paint over the brick. And then at the end we stucco over the brick. We do this all over the world. As buildings age we repoint them, paint them and then stucco them. In many parts of the world we preserve and save old buildings by stuccoing them. The historic folks on this side of the ocean just had a heart attack reading this. The good news is most normal people ignore those folks. Not everything ever built is historic. Just cause you are old does not make you historic. Photograph 1: "Aging Gracefully"—Manhattan, Soho, right down town. What's so interesting about this streetscape? The house on the left is brick masonry. The house in the middle is painted brick masonry. The house on the right is stucco over brick masonry. Better and better water control from left to right. Owners figure things out. Photograph 2: Prague, Czech Republic—The house on the right is brick masonry. The house on the left is stucco over brick masonry. As brick and stone buildings get old they leak. So how do we handle it? We try repointing the brick first. Then we paint over the brick. And then at the end we stucco over the brick. We do this all over the world. As buildings age we repoint them, paint them and then stucco them. Lets go back to the water thing. How do buildings get wet? Forget about the condensation thing and air leakage and diffusion. Minor compared to rainwater and groundwater. It is all about “how the building touches the sky” and “how the building touches the ground”. Check out Figure 1. Rainwater does not wet a building uniformly. Neither does groundwater, but groundwater is limited to…wait for it…the ground. The top of the building gets the wettest. The corners at the top next. And the very bottom of the building where rainwater splashes up (“splash back”) and where the building wicks water up from the ground. Then all you have to add are windows (Figure 2). The rainwater is not absorbed by glass, runs down and is concentrated at sills – particularly at the corners (“mustaching”). The window-to-wall interface gets more complicated of course because it is typically a hole-in-the-wall rainwater injection system. Figure 1: Getting Wet I (above left)—It is all about “how the building touches the sky” and “how the building touches the ground”. Rainwater does not wet a building uniformly. Neither does groundwater, but groundwater is limited to…wait for it…the ground. The top of the building gets the wettest. The corners at the top next. And the very bottom of the building where rainwater splashes up (“splash back”) and where the building wicks water up from the ground. Figure 2: Getting Wet II (above right)—Now add windows. The rainwater is not absorbed by glass, runs down and is concentrated at sills – particularly at the corners (“mustaching”). The window-to-wall interface gets more complicated of course because it is typically a hole-in-the-wall rainwater injection system. Guess what? Where a building gets wet it has problems. Don’t you just love Photograph 3? Compare it to Figure 2. Guess where all the “repointing” is happening. It gets worse at corners with “pseudo quoin corners”. Check out Photograph 4. The projecting brick catches the water and it gets trashed in a heartbeat. You don’t do quoin corners with brick…if you are smart (Photograph 5)4. If you are not smart you end up stuccoing them. First at the bottom where folks see them…and then up the entire side (Photograph 6). Notice also in Photograph 6 how the very bottom of the building is “fixed” – where the “splash back” is occurring simultaneously with the capillary wicking.5 Check out Photograph 7. Buildings really get trashed down low. So we fix them there first because it is easy to get there. Photograph 3: Wet Spot Problems—Where a building gets wet it has problems. Compare this image to Figure 2. Guess where all the “repointing” is happening. It gets worse at corners with “pseudo quoin corners”. Photograph 4: “Pseudo” Quoin Corners (above left) – The projecting brick catches the water and it gets trashed in a heartbeat. You don’t do quoin corners with brick. Photograph 5: True Quoin Corners (above middle) – No projecting brick. No brick. No problem. Photograph 6: Problem Quoin Corners (above right) – If you are not smart you end up stuccoing them. First, at the bottom where folks see them…and then up the entire side. Notice also how the very bottom of the building is “fixed” – where the “splash back” is occurring simultaneously with the capillary wicking. lots of time to get around to fix stuff. But not any more. We are insulating them – and insulating them with not just a little insulation but a lot. And when we do that and don’t get the water control right we get ugliness (Photograph 10). Freeze-thaw big time. Yes, we are seeing more and more freeze-thaw. And now you know why. There is no such thing as a free thermodynamic lunch. There are consequences for reducing energy flow. Photograph 10: Freeze- Thaw Big Time (above left) —Uninsulated mass buildings could tolerate wetting because of their high drying potential. We had lots of time to get around to fix stuff. But not any more. We are insulating them – and insulating them with not just a little insulation but a lot. And when we do that and don’t get the water control right we get ugliness. Yes, we are seeing more and more freeze-thaw. And now you know why. There is no such thing as a free thermodynamic lunch. There are consequences for reducing energy flow. Photograph 11: Neat Old Building (above right) – To be insulated on the interior. What to do? Easy, do the water control first. Then you have all kinds of options. If you don’t do the water control don’t insulate. If you don’t do the water control and you insulate you are basically euthanizing your building. Are there consequences everywhere? Yes, but they are “worser” in some places than others. What do we know? Well for freeze-thaw problems you need cold and you need wet. Take Figure 3 and look at the critical hygrothermal regions for freeze-thaw – cold and very cold climates since they get the most freezing cycles. Now take Figure 4 and look at the critical rain exposure regions for freeze-thaw – moderate rain exposure and higher. Now superimpose them (Figure 5). That’s where you absolutely have to intervene on the water control side before you insulate big time. If the stuff does not get wet it can go through infinite freeze-thaw cycles. It is hard to screw up a building in Edmonton – easy to screw it up in Chicago. Figure 3: Map of Hygrothermal Regions—The critical hygrothermal regions for freeze-thaw are cold and very cold climates since they get the most freezing cycles. Figure 4: Map of Rainfall Exposure—The critical rain exposure regions for freeze-thaw are moderate rain exposure and higher. Figure 5: Freeze-Thaw Risk (above right) – Figure 3 and Figure 4 superimposed. Locations where you absolutely have to intervene on the water control side before you insulate big time. If the stuff does not get wet it can go through infinite freeze-thaw cycles. It is hard to screw up a building in Edmonton – easy to screw up the same building in Chicago. So let’s say I have neat old building in New York (Photograph 11) and I want to insulate it on the interior and not screw it up (Photograph 12). What do I have to do? Easy, do the water control first. Then you have all kinds of options. If you don’t do the water control don’t insulate. If you don’t do the water control and you insulate you are basically euthanizing your building. Photograph 12: Typical Interior Condition – To “parge or not to parge is the question…” Probably not necessary to apply the cementitious rendering here. So let’s say I’ve convinced you to do the water control and you actually do it. What options do you have? One of the easiest and most robust is Figure 6 – high-density spray polyurethane foam applied directly to the interior of the mass wall. This works in all climate zones. Now, lots of folks, some for good reasons, some bad reasons absolutely refuse to use high-density spray polyurethane foam. I get it. Whatever. So now what? Figure 6: Robust Interior Insulation Approach — High-density spray polyurethane foam applied directly to the interior of the mass wall. This works in all climate zones. How about Figure 7. Apply a cementitious rendering on the interior the mass wall and coat this rendering with a vapor semi-permeable fluid applied water control layer. The rendering fills in the big gaps allowing the fluid applied layer to be applied in a continuous fashion. Now, apply high-density mineral wool directly against the fluid applied water control layer. Done. Caveat – this is limited to climate zones 4 or lower. Bummer. The assembly is not airtight enough and vapor tight enough from the inside to work in colder climates – unless, unless the interior relative humidity is kept low during the coldest two months – less than 30 percent in climate zone 5 and less than 20 percent in climate zone 6 and in colder places forgeddaboudit. Figure 7: High-density Mineral Wool —A cementitious rendering is applied on the interior of the mass wall and coated with a vapor semi-permeable fluid applied water control layer. The rendering fills in the big gaps allowing the fluid applied layer to be applied in a continuous fashion. High-density mineral wool is installed directly against the fluid applied water control layer. Caveat – this is limited to climate zones 4 or lower. The assembly is not airtight enough and vapor tight enough from the inside to work in colder climates – unless the interior relative humidity is kept low during the coldest two months – less than 30 percent in climate zone 5 and less than 20 percent in climate zone 6 and in colder places forgeddaboudit. We also have Figure 8. Maybe you can get away without a cementitious rendering. Just stud out the wall – do not – absolutely do not stud out the wall with metal studs – now insulated the cavities with cellulose or fiberglass and call it a day. No caveat? Nope. Big caveat. Same caveat as for Figure 7. Climate zones 4 or lower…or control the interior relative humidity. Figure 8: Cellulose or Fiberglass —Maybe you can get away without a cementitious rendering. Just stud out the wall – do not – absolutely do not stud out the wall with metal studs – now insulated the cavities with cellulose or fiberglass and call it a day. Big caveat. Same caveat as for Figure 7. Climate zones 4 or lower…or control the interior relative humidity. Aw man, can’t we do something else? Actually, yes. You can use a membrane “smart vapor barrier” (Figure 9). You need to protect it – that’s what the strapped wall horizontal framing does. And you have to be “fastidious” on the air sealing of the membrane. This gets tricky between floors and at punched openings – but it is doable. And here is the good part – no caveat climate zone wise. You can go to ugly cold places with this. Just remember the “fastidious” part. So why is the membrane called “smart”? Ah, it changes its vapor transmission based on relative humidity. Basically, it is vapor closed during the winter when the vapor drive is from the interior to the exterior. And it can become vapor open should the assembly need to dry to the interior if the cavity moisture levels rise. Let me repeat once again—if you don’t do the water control don’t insulate. If you don’t do the water control and you insulate you are basically euthanizing your building. Figure 9: Smart Vapor Barrier Approach —A membrane “smart vapor barrier” is employed to control air leakage and vapor diffusion from the interior. You need to protect the membrane – that’s what the strapped wall horizontal framing does. And you have to be “fastidious” on the air sealing of the membrane. This gets tricky between floors and at punched openings – but it is doable. And here is the good part – no caveat climate zone wise. You can go to ugly cold places with this. Just remember the “fastidious” part. Gus Handegord was found of saying “there are three problems in building…water, water and water” I miss the genius big-hearted curmudgeon. Apparently if you don’t know physics or chemistry you go into historic preservation…ok, not always true…but it drives me crazy that some folks would rather let a building destroy itself than to change it enough to save it…because “it has to be authentic…” If a window leaks and it has always leaked and there is no way to stop it from leaking unless I change its original design why can’t I do that? Why repair it in the same stupid way it was originally done? Why not change it so it lasts, but change it in a “stealthy” way that no one except an expert would notice? See “BSI-011: Capillarity‑Small Sacrifices” to see how and why the fix is done. . .